This year I wanted my toddler to have a hands-on experience of learning about the advent story. 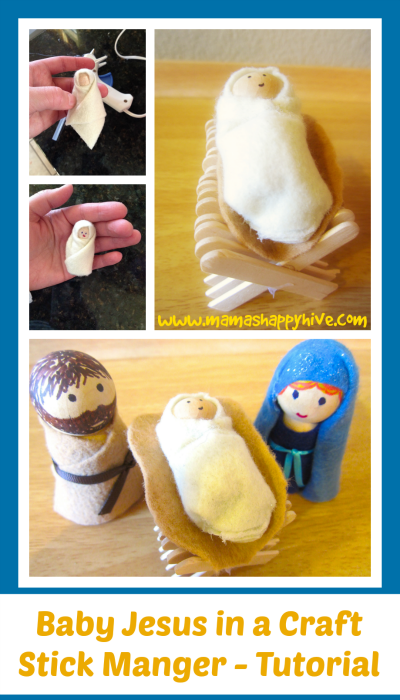 I decided to craft a nativity wooden peg doll baby Jesus in a craft stick manger, for him to touch and learn with. This sweet little baby Jesus peg doll is sure to touch a heart-string in your child's heart. My little boy likes to kiss baby Jesus goodnight and tuck him in bed. It's very endearing to behold. This is day 9 in the 25 day series - 25 Hands-On Nativity Lessons for Kids. 1. Find or make a child sized peg doll 2. Cut a piece of flannel in a long rectangular strip as shown in the picture above. 3. Place a dot of hot glue on the center of the peg doll's head. 4. Center the flannel piece over the peg dolls head as shown above, press the flannel down onto the hot glue dot. Then glue two more dots at the base of the doll's head/neck. 5. Wrap one side of the flannel around the front of the doll and glue into place. 6. Wrap the opposite side around the front of the doll and glue into place. 7. Now you should have the flannel shaped something like the picture above (#7.) 8. Tuck the end of the flannel up and around the bottom side of the doll. Glue the flannel into place. 9. Draw a simple face on the doll - two dots for eyes and a small smile. 1. 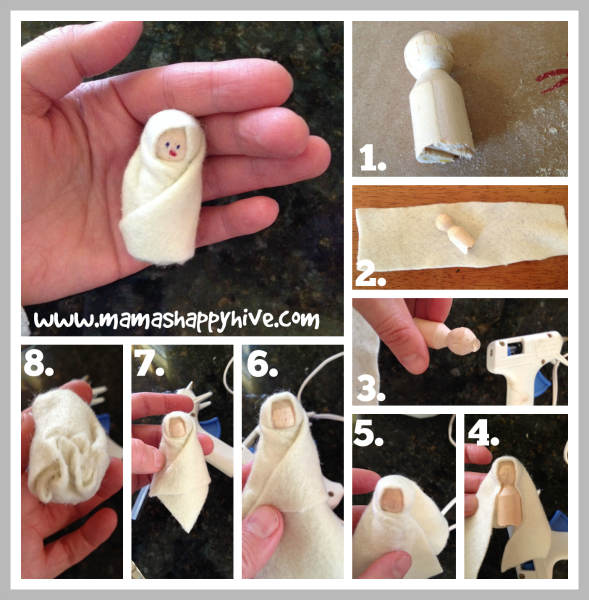 Use the baby Jesus doll as a guide for the size of the craft stick manger. 2. Cut the popsicle sticks in half with scissors. 3. Glue the popsicle sticks together in an X shape as shown in the picture above. 4. 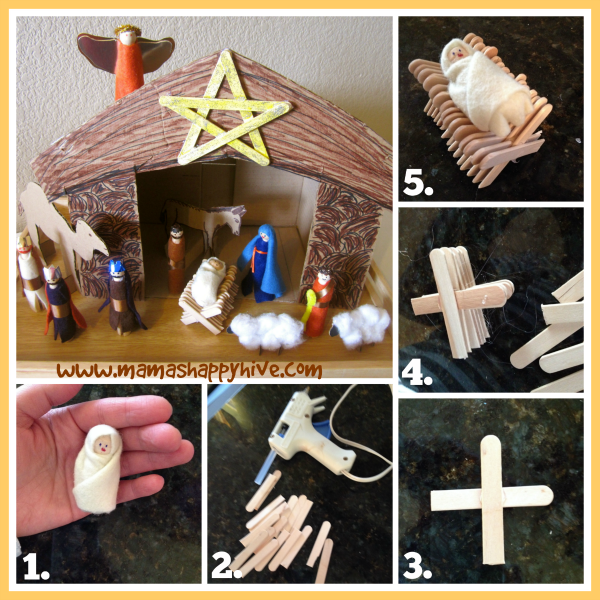 Keep alternating the popsicle sticks and glueing together until the manger is the right size for the peg doll. 5. Test the peg doll in the manger to see if it is the right size. Thank you for your visit! God bless you. I love this!!!! So creative! True meaning od Christmas!!! Pinned! Would be a great activity for our annual Advent workshop! Pinned!! That is just oh so cute! It seemed to come together fairly easily too. Great job! Hey, that’s nifty. I might have to do something similar if I ever get the craft bug!